My patients and clients often ask me about a quick ‘cleanse’ or detox program they can do such as juicing or special supplements, inquiring as to which ones I recommend. Once used to mean weaning the body off of alcohol and drug addiction, the word detox is now thought of as the panacea miracle for losing weight and flushing our bodies of anything and everything that’s bad for us. As a Functional Medicine Nutrition Therapist, I find the everyday consumer’s concept of cleansing and detoxing to be a slippery slope between scientific fact and fiction, especially when renowned physicians and healthcare experts are selling detox books, 30 day programs, supplements and the like. But don’t take their word for it – there are plenty of yoga studios, saunas, and spa retreats ready to take your money for the promise of detoxification. There are also superfood juicing recipes galore on the internet. Or you can opt for ‘hydrotherapy’ colonic irrigation during which a hose of water is guided into your colon to pump our your ‘plaque’ and impacted poo, washing away your inner toxins. I once tried it many years ago, disregarding the well known risk that the ‘hydrotherapist’ could accidentally perforate my colon, and I have to admit I was fascinated as the colorful particles of fruits and vegetable I ate the day before were described to me as they left my body. Ewwww right? I’d hardly call that detoxing though. I guess I have detoxification and cleansing to thank for becoming the dietitian I am today. Years before studying to become an RD, I too jumped on the cleansing bandwagon with a group of my friends seeking weight loss, and fell for one of the biggest ‘cleansing’ scams ever – the one where you take tons of ‘cleansing’ supplements and fast for 8 days only drinking psyllium husk and betonite clay shakes. We didn’t know that the products we were consuming contained a polymerising agent that turned our feces into a plastic consistency, so when we experienced a massive rubbery poo snake slithering into the toilet we truly believed we were cleansed of our ‘intestinal plaque’ forever. For years after that ‘cleanse’, I experienced terrible gastrointestinal problems including IBS, gluten and soy intolerances and the like which I now attribute to that program’s utter destruction of my body’s natural flora. It took years of intense probiotic therapy and a strict elimination diet to heal my gut but I eventually did, and felt inspired to become a Functional Medicine Dietitian because of it. So let’s separate out the fact from the fiction and get to the heart of the matter, or more correctly, the liver. 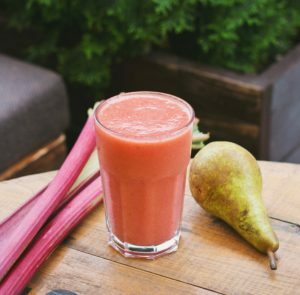 As complicated as the science looks, you can strive to achieve a healthier body through diet and lifestyle changes that will yield shorter and longer term results than cleansing pills, juicing, and the sauna alone can achieve. Adopt a diet that’s heavily whole food and plant-based, with abundant fresh fruits and vegetables and nuts and seeds including omega-3 sources like walnuts and flax/chia seeds. Juicing, in which you remove the plant fiber, is ok as long as its not your major source of fruit and vegetable intake. Going vegetarian or vegan is ideal for health as long as you adhere to the other guidelines for eating better. If you eat gluten-containing grains, eat them sparingly or not at all. Limit your sugar and sweetener intake. Limit your consumption of meat, poultry and dairy if you consume them. Factory-farmed, non-organic meat and dairy contains antibiotics and bovine growth hormones respectively, not to mention they promote unimaginable animal cruelty. Avoid processed foods, especially those with trans fats, nitrates, sugar substitutes and artificial ingredients or chemicals you can’t pronounce. Avoid genetically modified ingredients too. Drink abundantly throughout the day to avoid dehydration. Opt for filtered or spring water over juice or soda. Water with fresh lemon or lime or brewed unsweetened tea are great alternatives. If you enjoy alcohol, be sure to limit your consumption to the equivalent of 1 drink/day for women, 2 drinks/day for men. Our liver is designed to process alcohol but when you binge drinking too much at once you overload the liver, which can be extremely toxic to the body. Limit coffee or avoid it altogether. Whether you love outdoor sports, hitting the gym, or intense housework, be sure to work up a sweat regularly each week (check with your doctor before starting any new exercise program). Exercise boosts your heart and cardiovascular health, supports weight loss, lifts your mood, and helps your body to naturally detoxify. Saunas are also good for this but they don’t take the place of exercise. Medications, both prescription and over-the-counter like acetaminophen and ibuprofen, can wreak havoc on the liver, which is why we often hear we should not combine these with alcohol. These substances are not benign so be sure you understand what it is you are taking and its necessity. The same goes with taking dietary supplements as taking too much of the wrong thing can be more harmful than helpful. Certain supplements often contain fillers and artificial dyes that at best do nothing to help you and at worse are difficult for the body to clear. Birth control pills, other pharmaceuticals, and illicit drugs can all be incredibly toxic to the body so proceed with caution whenever possible. 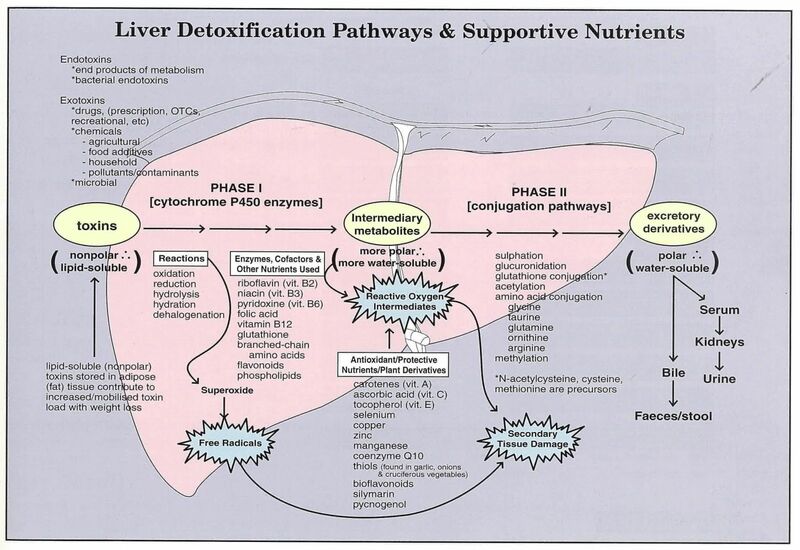 The body does its best healing and cellular repair while we sleep, including detoxification. Opt for 7 – 10 hours a day, or whatever amount you need to feel your best. Chronically short changing the sandman can lead to metabolic imbalances, a compromised immune system, difficulty with weight loss, and a host of other issues that affect the body’s ability to optimally detoxify. Consult a Registered Dietitian or other licensed healthcare practitioner for help with sleep issues. Or rather, learn to let go. Chronic stress wrecks havoc on the adrenal system and can lead to the same metabolic imbalances, compromised immunity, difficulty with weight loss, and other issues that inhibit optimal detoxification. Re-engage with loved ones and friends, enjoy a hobby, adopt a pet, take a break from technology, or practice mindful meditation… anything that can help you relax, unplug, and let go. Protect your lungs. If you smoke tobacco or marijuana, then quit. Avoid second hand, unfiltered smoke at all cost. Beware of harmful fumes at gas stations and in traffic congestion, when painting or using heavy duty cleaning products, and when around chemical solvents. Air out that new car smell and your freshly laid carpet because those fumes are toxic! Even traditional air fresheners are laden with toxic chemicals. Protect your skin. Avoid parabens and phenoxyethanol that are used as preservatives in shampoos, lotions, soaps, cosmetics, makeup, toothpaste, etc. Toxins consumed via our mouth are 90% filtered by the liver while toxins absorbed into the skin are 100% absorbed by the body, thus a skin dose is 10 times that of an oral dose. Look for natural brand alternatives that are made without harmful ingredients. Protect your digestive system. Don’t consume plastic polymer chemicals that rapidly diffuse into food when the food is microwaved or reheated in plastic or styrofoam containers. Use glass or ceramics whenever possible for heating and storing food. Throw away worn Teflon pans containing large scrapes and scratches. Avoid plastic bottles and tin cans that contain Bisphenol A (BPA). Beware the heavy offenders. Have you traveled to a far away destination and picked up a parasite or two? Do you have mercury amalgam fillings in your mouth? Do you work in agriculture where there is heavy herbicide and pesticide use? Does your trade require you to be around industrial chemicals? Artists, woodworkers, even cosmeticians are all at risk. A knowledgeable Functional Medicine practitioner can test for this kind of toxicity and prescribe proper protocols for how to detox safely and effectively. The promise of cleansing and detoxification claims to relieve symptoms of fatigue, indigestion, skin problems, constipation, excessive weight and brain fog, all of which are often symptoms of a toxic body. Rather than invest in trendy detox programs, costly books, a juicer, or supplements, why not start with the basic 7 pillars I’ve laid out herein. Taking initial steps for a few weeks is likely to make you feel lighter and healthier and will set you on a path for improved health and cleansing/detoxification for life. 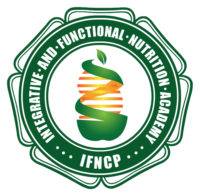 Should you be interested in a custom therapy program tailored to your unique health and nutritional needs, please contact me for more information. I really enjoyed this info. that you shared with my daughter Jessica, I am 47 years old and always looking to do better for my body and health in products and food. 6 months ago I started fermenting my own foods and drinks, due to me thinking it was a healthier way to cleanse the body and put in good bacteria, through my 6 month journey I am not sure if I did a good thing or not? Confused. I only say this because in six months a lot of changes in my body have not been good but bothersome for myself, it may not be the fermented foods I put into my body maybe it is just the change of life. Was wondering if you know about fermenting foods and if you have any info you could share. Thank you in advance, Happy Holidays!